Could you use a little help in getting organized? Our sales and design professionals are here to offer you solutions for those closet dilemmas. Ask us to show you a number of closet inserts that are sure to fit your organizational needs. We can demonstrate how our closet storage systems create order out of chaos. The typical closet is antiquated. It is not set up to meet the storage needs of the way we live and dress today. Sure, you have plenty of space to hang long dresses, but we see many closets that have a lot of unused space. With closet organization advice from our professionals, we design for you a space that is fully functional. You need plenty of space for shirts, pants, and shoes, as well as seasonal storage – especially if you are sharing closet space. Why not schedule an appointment for a free, in-home consultation? One of our professionals comes to your home to take a look at what you need and recommend custom closet inserts. Why struggle with organizing your closet when you can have professional assistance? We have training, experience, and product knowledge and are happy to put these to use on your behalf. Likely, you have tried to make a few changes here or there. Little changes help, but they do not make a significant impact on clutter. Your closet does not work for you or the clothes you have. Installing a custom closet system solves your storage problems and helps you to get ready quicker for now you know exactly where everything is. Let us show you how handsome and organized your closet can be. Take a look at Rubbermaid’s Heirloom Collection. These attractive systems have everything you need, starting with plenty of space to hang clothes; shelves for T-shirts, sweaters, and shoes; and cabinets and drawers for underwear and bags. We offer professional installation with our closet inserts. This way, you have someone who knows the products and the installation process doing the work for you. It is one less detail that you have to worry about. Plus, the results for closet insert installation ensure everything is done according to the manufacturer’s instructions. This means your new closet provides you with long-lasting organization. 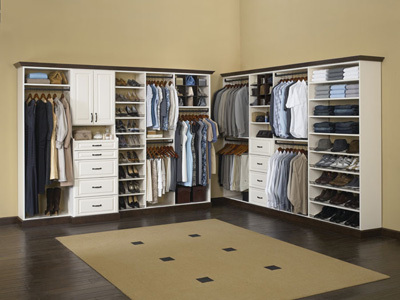 Contact us now for your free, in-home estimate for a closet organization system. We serve customers in Vernon, South Windsor, Ellington, Tolland, Manchester, Connecticut, and the surrounding communities.